Items with the same InvId will print on the same invoice. 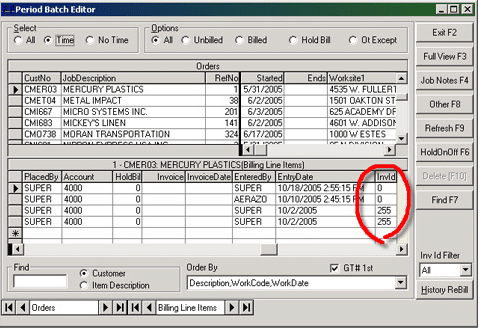 When time card entries are made and moved to the period batch editor the Invoice ID, “InvId”, field will either be blank (equivalent to a zero) or another number. Items moved from history using the [History ReBill] option will always carry an InvId (Invoice ID) of 255.